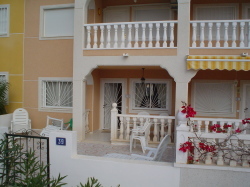 VILLAS AND APARTMENTS TO RENT IN CIUDAD QUESADA, SPAIN. Welcome to our selection of holiday homes to rent in Ciudad Quesada, Spain. The small town of Ciudad Quesada, located a few kilometres inland from the Costa Blanca resort of Torrevieja, was only created in the 1970s and is named after the man who built the first properties here, Justo Quesada Samper. As the town has grown, with new apartment blocks and amenities being built over the years, more and more people have come to live here. It is not a hugely popular town for tourists, but its proximity to some of the best beaches on the Costa Blanca, as well as some of the more interesting and historic inland towns make it a great base for exploring the region. The closest resort to Ciudad Quesada is Torrevieja, which has all the usual facilities that tourists in this part of Spain are looking for; bars, restaurants and of course, beaches. If you would prefer to sun yourself somewhere a bit quieter, there are many more secluded sands and coves east and west along the Costa Blanca, including the dunes at Guardamar which have been awarded a blue flag for cleanliness. Be warned, though, some of these quieter beaches are very popular with naturists and many expect to share the area with tourists without anyone causing a fuss. If you prefer your sunbathing to come with a different type of excitement, then Ciudad Quesada has its own small water park. It doesn't quite measure up to those on the coast, but it is much quieter than the bigger aqua parks in the region. As with most parts of the Costa Blanca, Ciudad Quesada is well served by golf courses, including its own centre called La Marquesa, which offers other sports and spa treatments for golf widows. There are several other courses within a short driving distance, including the very popular Royal Campoamor course, which always requires advance booking on weekends. Again within driving distance are several interesting towns and villages, which make a welcome change from the bustle of the Costa. The city of Murcia is not only full of historic churches and fortresses, but is also home to the nearest airport to Ciudad Quesada. Closer by is the smaller town of Elche, most famous for its amazing palm grove, consisting of over 200,000 trees and now designated a World Heritage Site by UNESCO. Next to the palm grove is the town's 13th century castle or alcazar, which was used as a prison during the Spanish Civil War and now houses a museum dedicated to the history of the region. Looking for self catering holiday accommodation in Ciudad Quesada? Then below is a selection of apartments in Ciudad Quesada and villas in Ciudad Quesada that can be rented direct from their owners. You can either click on each listing for further details or you can use our search engine on the left if you are looking for something in particular.